Dear colleagues, with the growing computational power and development of new computational methods importance of computer simulations in the polymer science is increasing, complementing classical theory and experiment. Therefore, following the long-term tradition of Bratislava International Conferences on Macromolecules, this year the conference is going to cover research fields dealing with computer modeling of macromolecules with the scope covering polymer computational physics, biophysics, statistical mechanics, modeling of biological systems, polymer topology, polymers in confinement, soft condensed matter and approaches to systematic coarse-graining. The BIMac2019 provides opportunities for polymer scientists who use computer simulations to share their experience and results, and establish new collaborations. 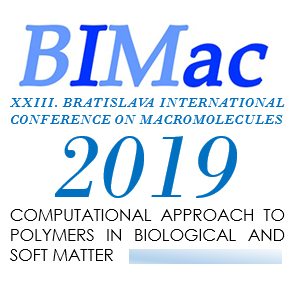 On behalf of organizing committee, I would like to invite you and your colleagues to participate in the 23rd Bratislava International Conference on Macromolecules: Computational Approach to Polymers in Biological and Soft Matter – BIMac2019 held from June 30 to July 3, 2019 in Falkensteiner Hotel in Bratislava, Slovakia. The registration has been just open through the conference webpage http://polymer.sav.sk/bimac. At the webpage you can also find the Abstract Template. We look forward to meet you in Bratislava.